A Sleeping Beauty Pantomime is coming to the Urmston Leisure Centre this February. Grab a ticket for the whole family and come along for this great show - it is one fun way to entertain your little ones. This is the perfect show for families as children of all ages will love this fun take on a fairytale classic. Pantomimes are popular around Christmas, so it is nice to see one in the new year. If you missed out on the fun over the Christmas holidays, there's still time to check out a show. Taking place around the time schools let out for the half term holidays, parents can cheer at the fact that they have a way to entertain their children. Sleeping Beauty is the classic story of the beautiful princess who falls into a deep sleep, due to an enchantment. A classic story, which is still popular today, this is a great show the whole family can enjoy. See the story brought to life in a fun new adaption. Pantomimes are a lot of fun as well, who doesn't love to shout and scream and boo the villain. Come along and get ready to cheer when Sleeping Beauty finally awakes. Adult tickets cost £12, with £8 for concessions and children under five go free, making this a reasonably priced event that won't break the bank. Groups can grab a bargain with one free ticket for every group of ten and there are no booking fees. Finding cheap things to do in the school holidays can be difficult at the best of times, so this show is a life-saver. 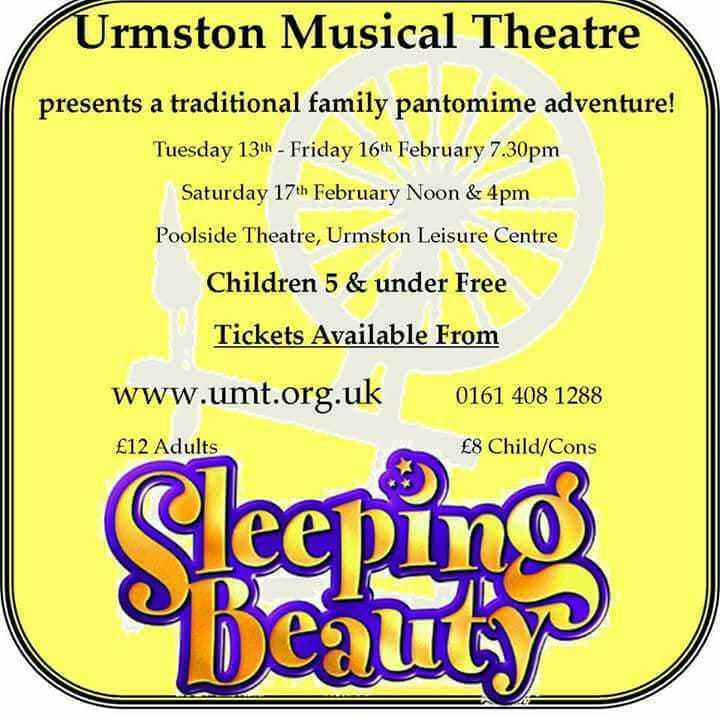 Urmston Musical Theatre is a charitable organisation which showcases local talent and promotes the dramatic arts in Trafford. The organisation has been around since 1911 and is still making great shows today. As champions of local talent, this is your chance to support actors from the city. The February pantomime is a yearly event, which could become an annual trip for you and your family. Taking place at Urmston Leisure Centre on Bowfell Road, the show is on between the 13th and 16th February at 7.30pm, with another show on Saturday 17th February at 12pm and again at 4pm. Make sure you don't fall into a deep sleep before you book a ticket, as you will not want to miss out.